Preheat oven to 400 degrees. In a large bowl, toss the bread with 1/3 cup of olive oil, salt, pepper and garlic. Lay the bread onto a large shallow baking sheet and toast until just golden, about 10 minutes. Allow to cool. In a medium bowl, whisk together the 1/4 cup of Tuscan Herb Olive Oil and the Aceto 4 Balsamic Vinegar. 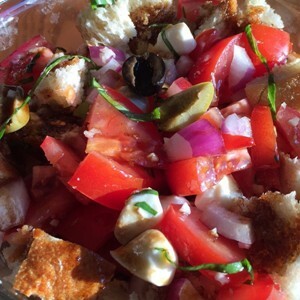 Gently combine the bread, tomatoes with juice, onion, basil, olives and mozzarella. Toss with the vinaigrette and let stand for a few minutes then serve.